West Yorkshire 5 piece, the 309s, have spent the last ten years rocking and rolling their swing/ country/jive repertoire at events all over the country. Think Hank Williams, Bob Wills and early Johnny Cash joining forces to make a classic 20th century sound that is the roots of rock and roll. Crowds have danced the days and nights away to the 309s’ beat at an extraordinary range of festivals and gigs. There's been one hell of a lot of popular music recorded since gramophones were invented. So many brilliant songs composed, arranged and brilliantly played. So much to choose from... The 309s take their pick of songs mostly from the Southern States of America, between the years 1925 and 1955. This gives us quite a range of music, from Western Swing ("jazz with a cowboy hat") perfected in Texas by Bob Wills, right through to Rock 'n' Roll's early days in Memphis, Tennessee. On the way we take in early country and blues forms, from the likes of Hank Williams, Johnny Cash and the Louvin Brothers, brilliant forerunners to the Everly Brothers. We take these wonderful songs, we work out what makes them great, and we use our instruments and skills to play them the best way we can. We want to entertain. We want our audience to have a good time, dance, laugh, shout, jump about or even just listen and enjoy. Some of the songs you'll know (Folsom Prison), some you'll half know (Trouble in Mind) and some you'll just get to know! "THE 309s : Halfway to Heaven - what if paradise was hidden in the Yorkshire moors? Well with this English quintets' music you're nearly there. This group expanded with a new blues style vocalist in 2012 but it's the violin which is the real heart of the 309s. 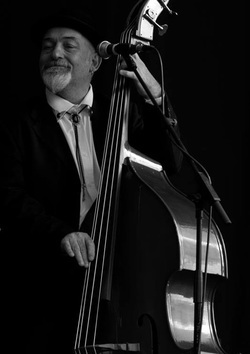 It shifts from one swing style to another, drawing in the double bass, complimenting the guitar. The style of these musicians from the centre of England never turns melancholic. You rock, you swing with jubilation all the way through the 13 tracks from the 40s and 50s. To make your mouth water a bit, let's just mention Yes Sir, My Window Faces South, This Little Girl's Gone Rocking, See You Later Alligator, I've been Everywhere. A group worth checking out as quickly as possible!" “Fiddling and swinging without being pervy”. That’s how one member of the band describes their music. Another is a little more forthcoming, explaining that what they play and love comes from 40’s and 50’s America: the all-too-short tunes, written for radio-play, that preceded both rockabilly and rock and roll. Optimistic, ironic, lively and very, very danceable. The band is made up of a fiddler who can fly when the mood takes him, not to mention singing or playing the trumpet; a guitarist and lead singer with an Elvis-like stance and charisma to match; a stand-up bass player with a glorious baritone; a rock steady drummer, playing the startling wooden drum kit he made himself and a singer, in her shimmering 50’s Vogue frock with such a voice: from light as a feather to an uvula rattling growl. At the New Inn they treated a packed house of regular fans and the local Saturday night crowd to 30 numbers in two sets over the best part of three hours. The band’s passion for their genre and their musicianship were self evident in how they played and the fun they themselves were obviously having. Laughing on stage with each other and the audience? Whatever next? The dance floor heaved for the entire second set, and rightly so. A shame that pub acoustics aren’t always kind to lyrics, which are such an important part of this kind of music. If you’re a punter treat yourself and go and see the 309s. If you have a venue, book ‘em. If you want a swinging good time, we are the band for you! For many years Rod’s stunning vocal has been the main attraction in bluegrass and Cajun bands. 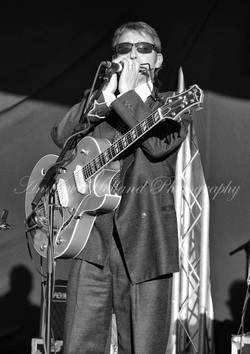 Now he has added lead guitar and harmonica to his rock solid rhythm playing and fronts the 309s with his astonishing versions of familiar and hidden classic songs. Rod's other job is making high quality leather cases and accessories for musical instruments, under the name of Pinegrove Leather. Everything is made from scratch in his workshop in Hebden Bridge. Check out www.pinegrove.co.uk for pictures and details. 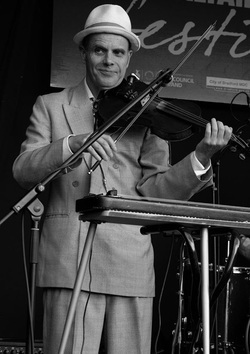 After stints with country, rock n roll, cajun and skiffle bands Ian takes lead fiddle into new territory with his love of swing style and musical experimentation. A few years back he tried out the lap steel with startling success, and gave a whole new dimension to the 309s sound. Caution: Occasionally plays trumpet with variable proficiency, usually resulting in enthusiastic applause. Anchoring the 309 sound is the steady pulse of John’s bass. He shifted from guitar to bass many years ago and has never looked back. He occasionally adds variety to the vocal mix with a selection of blues and swing songs. Tim is able to create an amazing variety of sounds from a single snare drum. His years keeping jazz and blues bands together pay off for the 309s, by making sure that the dancers' feet stay flying. 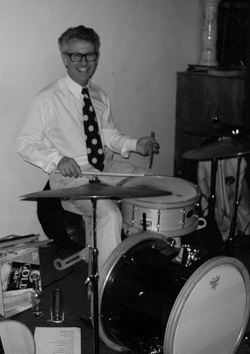 In our early years, Tim was limited to a snare drum, hi-hat and a large suitcase with a foot pedal attached. We now allow him to have another couple of cymbals and a real bass drum - a 1920s marching band monster. There is usually still room for the old suitcase on stage though, along with its raggy old 309s decal. Our newest band member joined in 2012 and brings electrifying lead and harmony vocals to the band. She previously led her own self-named jazz quartet and sang with a ska band. 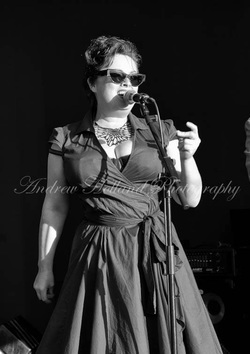 She now adds the 309s' swing sound to her repertoire, both as a solo vocalist and also providing sweet harmonies. So ... Where have we played?